Sparkling pink low top trainers from Converse. The toddlers’ ‘Chuck Taylor All Star’ trainers have a party dress-inspired, glitter upper with two Velcro straps and a heel pull loop to easily pull them on and off. The sneakers sit on a white rubber sole with a textured outsole for added traction and a logo licence plate on the heel. A Converse logo patch on the tongue, a contrasting midsole stripe and a rubber toe cap complete the design.Upper: Synthetic. Lining: Textile. Sole: Rubber. Kids’ ‘Simple Step’ high top Converse from the ‘Chuck Taylor All Star’ collection. Inspired by the theme of London Transport, the shoes are designed to look like a London bus, with wheels printed on the soles and windows on either side. The shoes secure with a Velcro flap and feature a heel pull tab for super easy on and off. The signature vulcanised rubber sole offers maximum grip and stability. Upper: Synthetic. Sole: Rubber. Toddlers' low top trainers from the ‘Chuck Taylor All Star’ collection. Showcasing purple canvas uppers, the mini trainers feature Velcro straps for easy dressing, a rounded toe with contrast toe cap, and a logo to the tongue. Finished with branded heel counter and vulcanised rubber sole. Pull loop to the heel. Upper: Canvas. Sole: Rubber. 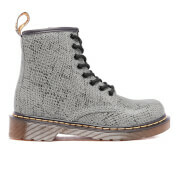 Kids' high top Dr. Martens with snake effect, leather-look uppers; a smaller version of the iconic 1460 8-eye boot. The 'Delaney ASP Viper' shoes are crafted with faux-snakeskin uppers and feature eight eyelet lace-up for a signature look. Goodyear-welted, the boots feature a heat-sealed upper and sole that are sewn together for durability, and contrast yellow welt stitching for an iconic finish. For easy entry and removal, the boots are equipped with a zip to the inside foot, and a pull loop to the topline. Complete with the brand's signature AirWair bouncing sole for enhanced comfort. Upper: Synthetic. Sole: Rubber. Kids' iconic lace-up Dr. Martens boots; inspired by the classic adult's silhouette. Crafted from traditional twill canvas with a striking leopard and skull print, the 'Delaney' ankle boots feature a rounded toe, eight eyelet lace-up and a zip fastening to the inside foot for easy dressing. Set upon a flexible, non-slip sole that has been cemented to the upper for durability. Signature yellow stitches and pull loop to the topline complete the design with signature qualities. Upper: Canvas. Sole: PVC. 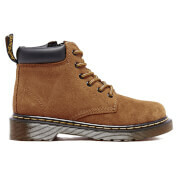 Kids’ ‘Delaney’ boots based on the iconic 1460 silhouette from Dr. Martens. Crafted from purple patent Lamper leather, the 8-eyelet boots feature an inside zip closure to easily get the boots on and off. Set on a durable air cushioned sole which is cemented to the upper; the boots feature the signature sole pattern for added grip. Complete with contrast yellow stitching and an ‘Air Wair’ woven brand tab to the heel. Upper: Leather. Sole: PVC. Kids' Dr. Martens with water-resistant nubuck leather uppers. The 'Padley J' boots are crafted from lightweight suede and feature six eyelet lace-up and a padded collar for enhanced comfort. Goodyear-welted, the boots feature a heat-sealed upper and sole that are sewn together for durability, and contrast yellow welt stitching for an iconic finish. For easy entry and removal, the shoes are equipped with a pull loop to the topline. Complete with the brand's signature AirWair bouncing sole for enhanced comfort and improved slip resistance. The sole is oil and fat-resistant. Upper: Leather. Sole: Rubber.